The structure was taken from a foreclosed property in Lebanon, and police say one of the suspects had crystal meth and prescription pills that had not been prescribed to him. Three men were arrested in Lebanon after state troopers caught them using a pickup truck to drag a stolen shed down the road, according to Maine State Police. Troopers were called to the York County town on Sunday by a concerned citizen who reported three men had stolen a shed from a foreclosed property on Pork Street and were dragging it away. When troopers arrived, they found the men still dragging the 25-foot-long shed, which was blocking half of Heath Road, state police said. 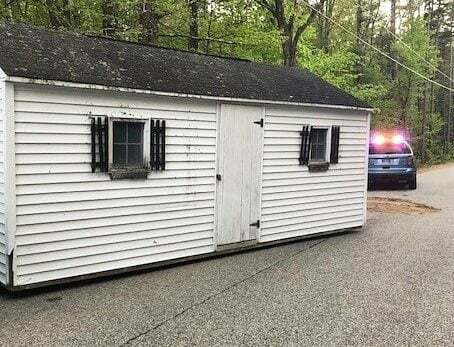 Matthew Thompson of Lebanon, Timothy James of Pembroke, New Hampshire, and Robert Breton of Milton, New Hampshire, were arrested after troopers verified the shed was indeed stolen. State police said Thompson was found with crystal meth and prescription pills that had not been prescribed to him. He was charged with unauthorized taking or transfer, and state police will seek indictments for unlawful possession of a Schedule W drug, reckless conduct, criminal mischief and unlawful possession of a Schedule Z drug. James and Breton were charged with theft by unauthorized taking or transfer and are expected to be indicted on additional charges of reckless conduct and criminal mischief, police said. All three men were taken to the York County Jail and held on $5,000 bail. The York County Sheriff’s Office assisted with the case.